Have your wallpaper ever changed automatically ? Have the programs ever started without your initiation ? Have the browser opened unexpected websites automatically ? Simply have you ever felt that someone else is controlling your computer ? NO ? Congrats, you probably haven't been a victim of trojan yet. dangerous. 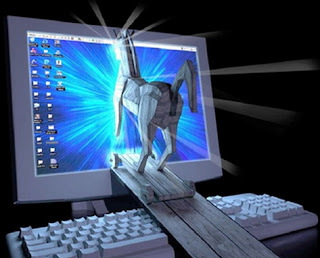 A trojan gives the full control of victim's PC to the attacker. 2. Attacker might hide this server.exe or serverhost.exe behind any genuine file like a song or image. Attacker gives this file to victim and victim is supposed to double click on it. 3. As victim run that server part , a port on victim's computer gets opened and attacker can control his PC sitting remotely in any part of the world through the control panel(client part). Attacker can do anything with victim's computer remotely that victim himself can do on his computer. Note: I am assuming that you know a little bit about IP addresses. 1. 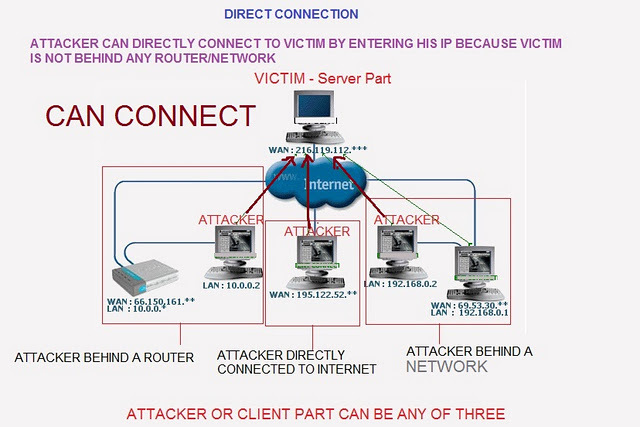 Direct Connection: In this method, after the server part has been installed on victim's machine, the attacker enters the public IP address assigned to victim's computer for making a connection to it. But limitations of direct connection is that public IP address is most probably dynamic and gets changed everytime one disconnects and reconnects. So attacker needs to find out IP address of victim each time. Moreover the incoming connection like this is usually restricted by firewall. 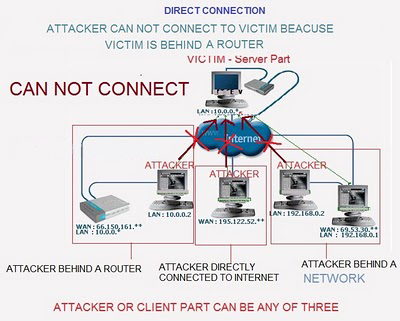 The main limitation of direct connection is that you can not access the victim who is behind a router or a network beacuse victim's machine is not assigned public/external/wan IP. It is only assigned private/internal/lan IP which is useless or meaningless for computers outside that network. The wan IP belongs to his router. It doesn't matter how attacker is connected to internet. Attacker can be connected to internet any of three means. Victim is behind a router in this case. 2. Reverse Connection: In this method, attacker enters his own IP address in server part while configuring it. So when the server part is installed on victim's computer, it automatically makes connection with client part that is attacker. Also the firewall in victim's machine would not restrict to outgoing connections. Problem in this case is same that attacker's IP is also dynamic. But this can be over come easily. Attacker actually enters a domain name in server part which always points to his dynamic IP. Note:This was just a basic theoretical guide of Trojans.